Fork & Flame is back for another 'Le Caquelon' fondue night, this time at their new, larger venue - The Table Cafe in Southwark Street, near Borough Market, on Saturday 14th March. 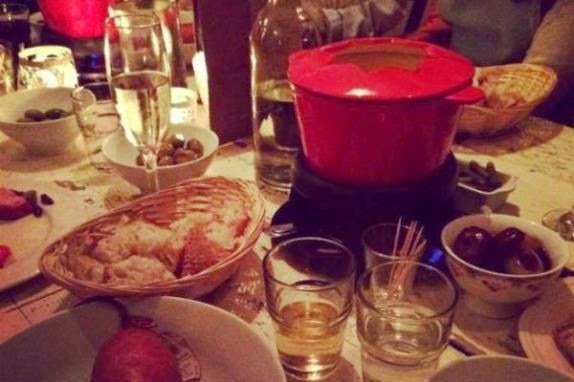 It's £32 for the food for the night - expect... Fondue! "On the back of three sold out events in November and December, be ready for a mouthwatering dose of fondue and a decadent array of artisan ingredients, as featured In The Evening Standard Going Out guide to cheesy feasts! We bring you ‘Le Caquelon’ - indulgent fondue nights to stave off the winter cold and satisfy your hearts’ cheesiest desires! What sets these events apart is a focus on the quality of the ingredients rather than the usual Alpine frippery. All the food will be sourced from the Jura Mountains in Eastern France, home of the caquelon - the traditional fondue pot of culinary legend - and London's own Borough Market. We are really excited to bring you our first event of this year at a fantastic new venue in the heart of the South Bank, a stone's throw from Borough Market! This is a fully waitered event. Fondue is a really sociable way to eat, and diners can book to sit with friends or buy single tickets to sit with new friends on our long communal tables of 8 - 12."